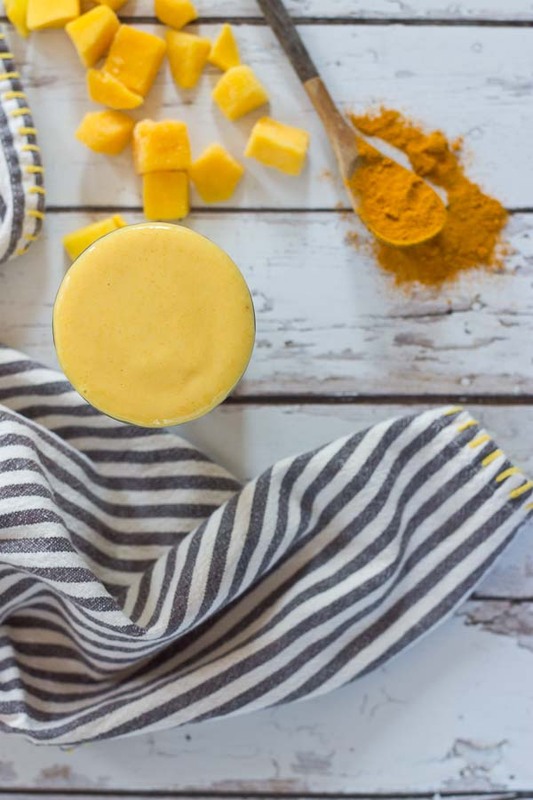 This Golden Milk Turmeric Smoothie makes you feel good from the inside out. 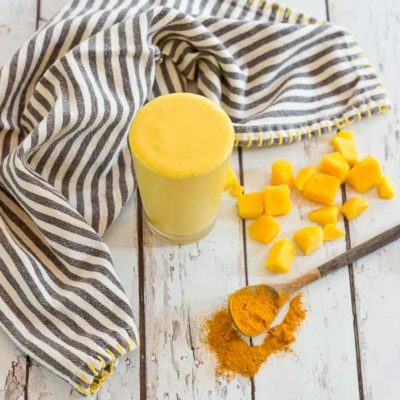 With only 4 ingredients, banana, mango, kefir and turmeric, it’s easy to prepare this creamy anti-inflammatory smoothie. Because hello, gawwwgeous anti-inflammatory breakfast! This golden milk recipe is legit. 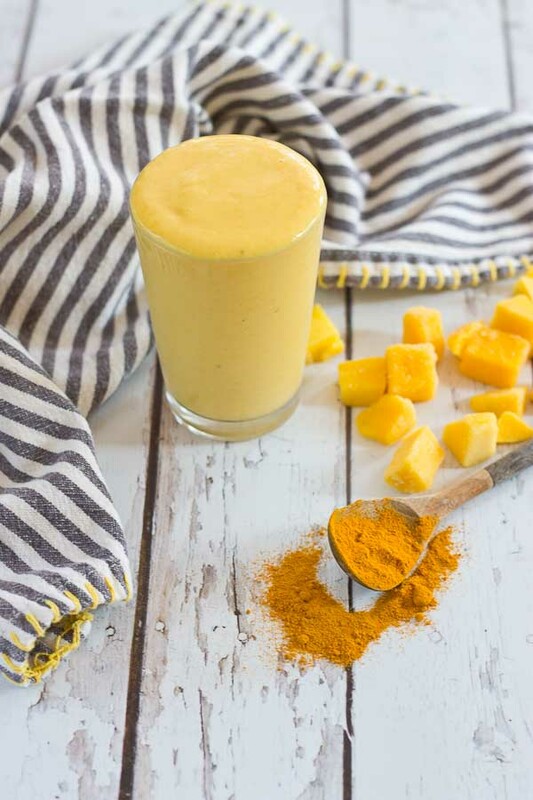 You may be thinking to yourself what is turmeric… well it’s the superstar of this golden milk smoothie. 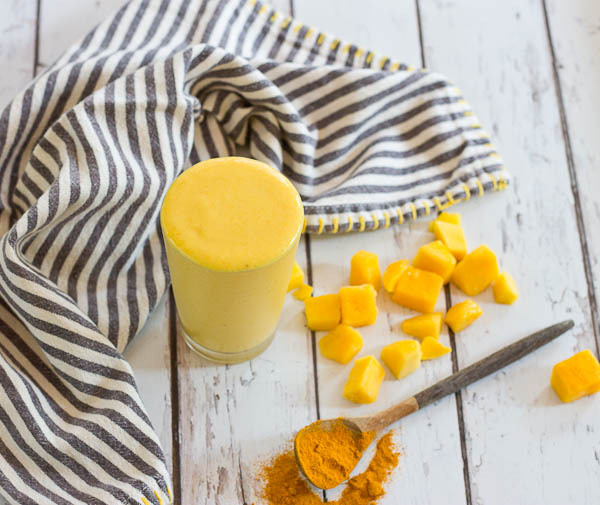 It’s the bright yellow spice that gives curry its color and this smoothie that gorgeous golden hue. 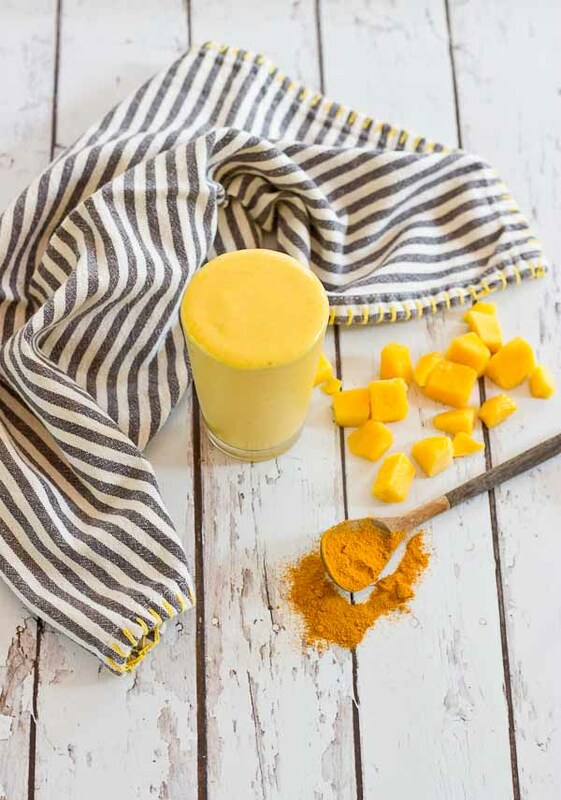 Turmeric, the superstar in this kefir smoothie, is a bright yellow spice that acts as a powerful anti-inflammatory. Turmeric comes from an ancient root and has been used in Indian and Chinese medicine for centuries in addition to serving as a powerful anti-inflammatory in food! I’ve been dying to share this turmeric smoothie recipe with you because it’s my new obsession. Or maybe we should say it’s a spice obsession because I’ve been adding turmeric to eeeerrr thing lately– from teas to oatmeal. I know right, it’s such a versatile spice. Turmeric can be used in your favorite dishes like turmeric chicken, turmeric rice, turmeric oatmeal to drinks like turmeric tea, turmeric smoothies, turmeric lemonade, to beauty products like a turmeric face mask, turmeric toothpaste and turmeric soap. I’ve even eaten turmeric chocolate! I totally had this convo with the hubs the other day. “Hey honey, remember that smoothie I made you the other day that you loved? ?”… well, the secret is out. Yep, I dashed a bit of turmeric into that yummy smoothie recipe. Ya’ll it’s so so good. I feel like adding turmeric gives a little warm and spicy flavor that is oh so comforting. I’m currently eating a bowl of Greek yogurt, or parfait rather (because I can’t do just yogurt), with berries, strawberries, coconut flakes, ancient grain seeds, and a sprinkle of TURMERIC and cinnamon on top. It’s divine friends. If you don’t have turmeric in your spice rack, go buy some. While popular google searches are for turmeric for skin, turmeric for arthritis, turmeric for teeth whitening, turmeric for colds, turmeric for joint pain. And the loads of health benefits for consuming the spice, what are the real healthy benefits of turmeric? Nutrient content: 2 teaspoons of turmeric – 16 calories, 17% daily manganese and 10% daily iron. Also a great source of vitamin B6, dietary fiber, and potassium. Curcumin is the main active ingredient in turmeric and a very strong antioxidant. It fights inflammation in various ways at the molecular level and as a result inflammation is reduced throughout the body. Chronic, low-level inflammation is believed to play a role in the development and progression of various diseases, including: heart disease, cancer, metabolic syndrome, Alzheimer’s and various degenerative conditions. Curcumin not only acts as an antioxidant, neutralizing free-radicals in the body, but also boosts the activity of your body’s own antioxidant enzymes, thus further increasing your antioxidant strength. Curcumin boosts levels of the brain hormone BDNF. As a result, this increases the growth of new neurons and fights various degenerative processes in the brain. Curcumin is enhanced by pipeline (bioactive compound in black pepper), but that doesn’t mean you can’t enjoy it on its own or get any health benefits. 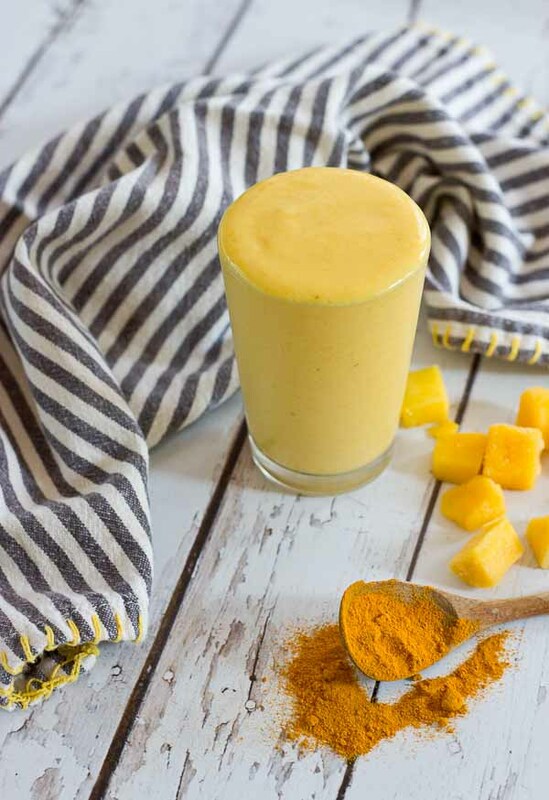 If you want even more powerful turmeric effects add a bit of black pepper to this turmeric smoothie. It’s quite tasty in a savory sweet kind of way. How much fresh turmeric for 1 teaspoon spice? I’d probably use 1/2- 1 inch of fresh turmeric. It really is a taste preference though, so start small and add more until you get the flavor you like! There isn’t a clear recommendation on dosage as more research is needed. But good news is that adding the spice to your diet has been shown to reduce inflammation. Here’s a helpful article on some of the turmeric dosages in various disease related studies. P.S. – If you love smoothies as much as I do, check out my Coffee Lovers Protein Shake. High in protein, low in sugar and just enough caffeine to tackle that to do list! Wow, This sounds perfect also yummy. I never try a golden milk turmeric smoothie before. But after seeing this I can’t wait to make this. Thanks for the sharing such a yummy recipe with all of us. My husband is allergic to mangos. Will any fruit do? Frozen banana? I think mango gives a creamy consistency. You could even do a mix of banana and pineapple if that sounds good to you! How much fresh turmeric would you substitute for the spice, or what is the weight of 1 tsp of turmeric? How many times a day should drink this for inflammation? I found your site after searching for a tumeric smoothie. This sounds perfect. Also, I was wondering if you could provide the source for the tea towel. I love the pop of color. Thanks and you definitely have a new fan. I’m so glad you found this recipe! It’s one of my favorites too. I just checked on the towel and it’s from World Market– maybe got it last year? and THANKS!! After reading this I added a little turmeric to our morning bowl of oatmeal and my husband fell in love with me all over again. Please tell me we can get the benefits of turmeric even if we heat it! ooh good question! From looking at the research (which is limited), it does not appear that heat has a negative effect on turmerics beneficial qualities (some may actually say heat can enhance it’s effectiveness). What can I substitute for the kefir?? You an totally use greek yogurt + milk/milk substitute… or if you’re dairy free the milk sub will be fine, it just won’t be as creamy.